A form model is usually a PHP class which creates a number of fields. The base class for all form models is the Form class defined in the Zend\Form component. Fields in a form model can optionally be grouped into fieldsets. 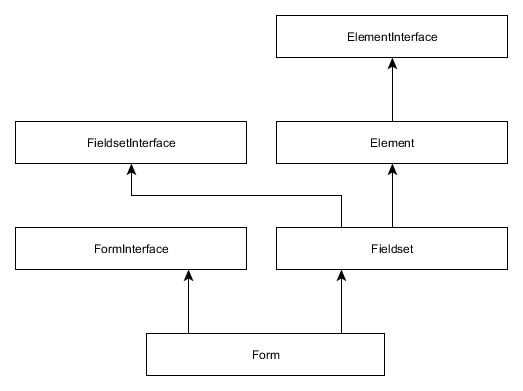 Moreover, the form model itself can be considered as a fieldset. This fact is reflected in form class inheritance (figure 7.10). As you can see from the figure, the Form class extends the Fieldset class. The Fieldset class, in turn, is derived from the Element class which represents a single form field and its attributes. This class inheritance may look strange at first sight, but everything becomes logical if you remember that the Form class inherits methods for adding form fields from the Fieldset class, and that it inherits methods for setting form attributes from the Element class. As you can see, form models of the web site's Application module (by convention) belong to Application\Form namespace (line 2). In line 7, we define the ContactForm form model class which extends the Form base class. In line 10, we define the constructor method for the class. Because we derive our form model from the base Form class, we have to call the parent class' constructor to initialize it (line 13). The parent class' constructor accepts an optional argument allowing it to set the form's name ('contact-form'). We can also set form data delivery method (POST) by using the setAttribute() method provided by the base class (line 16). The setAttribute() takes two parameters: the first one is the name of the attribute to set, and the second one is the value of the attribute. You also can set the form's "action" attribute (line 19) with the setAttribute() method, analogous to the way you did with the "method" attribute. Actually, as you will see later, setting the form's "action" attribute is optional. Setting the "action" attribute for the form is optional, because empty form action forces the browser to submit form data to the URL of the current page. This is sufficient in most scenarios, because usually you use the single controller action for both displaying the form and processing its data. Form fields are typically created inside of the form model's constructor (look at line 21). In the next section, we will learn which form fields are available and how to add them to the form model.